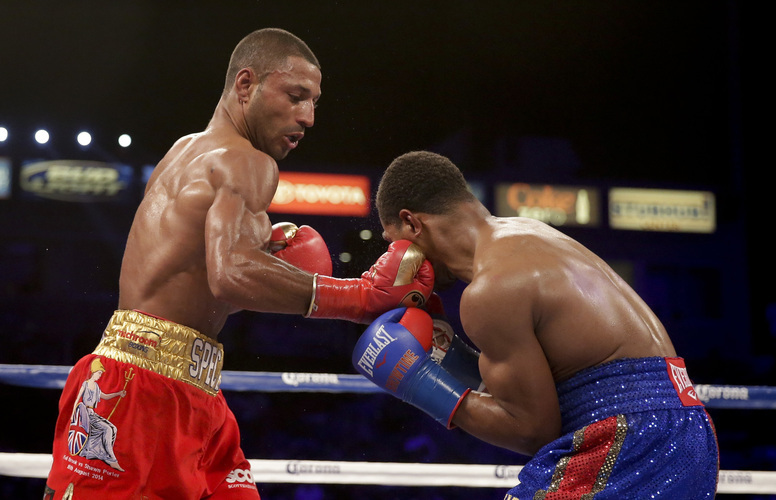 CARSON, California — Kell Brook waited years for a world title shot, honing his skills through numerous injuries and postponements. When the English welterweight finally got in the ring with a champion, the patient challenger had a perfect plan. Brook won a majority decision over Shawn Porter on Saturday night, claiming Porter's IBF 147-pound title. "Since I was 9 years old, I've been training to be a champion," said Brook, who collapsed to the ring in joy after the decision was announced. "I looked scrappy, but I did what I have to do." Brook (33-0) claimed the welterweight belt in just his second fight outside Britain, outboxing the American champion with a smart game plan and consistent elusiveness at the outdoor StubHub Center south of Los Angeles. Brook joined elite company with the win: Floyd Mayweather Jr. and Manny Pacquiao hold the other three major welterweight titles. "I dealt with business," Brook said. "It's an unbelievable feeling, and I can't get my head around it." With a small coterie of English fans cheering his moves, Brook stayed outside the champion's power range and held inside when necessary, never allowing Porter (24-1-1) to find a consistent range in his first defeat. Brook won 117-111 and 116-112 on two American judges' cards, while English judge Dave Parris scored it a 114-114 draw. The Associated Press saw it 115-113 for Brook. Omar Figueroa also stopped Daniel Estrada early in the ninth round to defend his WBC lightweight title belt in an entertaining action fight, and Anthony Dirrell claimed Sakio Bika's WBC 168-pound title with a messy rematch victory. But the star was Brook, who had been waiting nearly two years for his shot at the IBF belt. Three bouts against former champion Devon Alexander fell through before he received the mandatory title shot at Porter, who beat Alexander last year. Brook had a canny game plan from the start, keeping Porter at bay with his superior reach and landing well-timed shots when Porter attempted to force the action. Both fighters were cut early on by accidental head-butts, but the injuries didn't appear to affect them. Brook became more assertive in the later rounds, stalking Porter to the ropes while landing cleaner punches. The Englishman connected with several big shots in a dominant 11th round and finished impressively, getting carried on his cornermen's shoulders after the final bell. Brook landed 36 percent of his 441 punches, while Porter connected with just 25 percent of his 626 shots. Brook thoroughly outjabbed Porter, who threw 308 more power punches, but landed a much lower percentage. Porter, who never landed his vicious left hook consistently, wasn't surprised by the decision in his first bout since a dominant defense against Paulie Malignaggi in April. "I thought that I was effective with my attack, but he was ready," Porter said. "I'm not giving any excuses. I want the rematch. I'll find him where he's at, and I'll take it from him." Brook is much more interested in a lucrative matchup with fellow British champion Amir Khan, who tweeted his congratulations to Brook moments after the fight ended. "Shawn Porter is a true champion, but I think Khan can get in queue now," Brook said. "I think that the British public needs to see this fight against Khan." Dirrell (27-0-1), a lymphoma survivor from Flint, Michigan, claimed his first world title in a sloppy, flop-filled rematch with Bika (32-6-3), a Cameroon native fighting out of Australia. Dirrell tumbled to the canvas several times in the second bout, and Bika was docked a point in the eighth round. "It means the world to me, coming off cancer," said Dirrell, who also survived a serious motorcycle accident in recent years. "I was staying off the ropes. I outpunched him, I outlanded him and I got the job done." 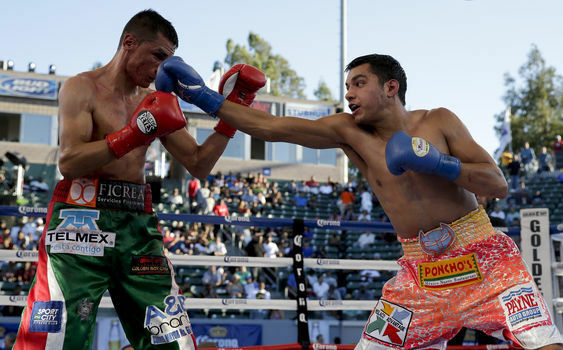 Figueroa (24-0-1, 18 KOs), a rising star from Texas, put on another crowd-pleasing display against Estrada (25-3-1). Both fighters traded enormous shots in an exciting eighth round, but Figueroa dropped Estrada with one devastating right hand early in the ninth before finishing the bout with a lengthy flurry of punches. Figueroa intends to move up to 140 pounds for his next bout. Unbeaten heavyweight Deontay Wilder (32-0, 32 KOs) stopped Jason Gavern after four rounds in an early fight, shutting down an overmatched opponent to keep busy while he waits for his mandated shot at injured WBC champion Bermane Stiverne.